I first heard about this on NPR, when Dorie Greenspan was interviewed for a fall baking dish and also to promote her new book of Around my French Table. Which I promptly put in my Amazon cart and which I now possess. But because she encourages you to make this recipe your own, mine is nothing like hers except you start with a hollowed-out pumpkin and somewhere along the line you fill it will good things, put it in a 350 degree over for 90 minutes to two hours. So I bought a sugar pumpkin at Trader Joe’s one day, and since we were having company for Halloween Night (the trick-or-treaters in our neighborhood all grew up and went to college), I decided to try this. Mine is stuffed with a small pasta blend (from Trader Joe’s), mushrooms and some Jimmy Dean’s sage sausage. I roasted it with the lid on for 90 minutes, and it was done. It makes a great presentation. Start with the way Dorie starts: cut the lid off a pumpkin and hollow it out, scraping the flesh slightly to get rid of the stringy bits. Sprinkle the inside cavity with salt, pepper and nutmeg. I found it easier to grind the salt and pepper onto my cutting board, then pinch by pinch, sprinkle it around the inside cavity (the nutmeg went on from the spice bottle, no trouble). Set aside. In a medium size pot, brown the sausage well. Turn off the heat, set aside. Wash and cut about 3/4 pound crimini mushrooms into chunks. In 1 Tablespoon butter, sautee half of the mushrooms in a saucepan (you’ll use this saucepan later for the pasta cooking); don’t crowd. As they get done, dump them into the sausage, stir to mix. When mushrooms are done, in about 1 Tablespoon olive oil, cook until slightly soft: 1 shallot, chopped and 1 large (2 small, or 3 weensy) cloves of garlic. Stir in 1 and 1/4 cups of Harvest Grains Blend** mix (about 1/2 of the package), then add in 1 can of reduced salt Swanson’s chicken broth. 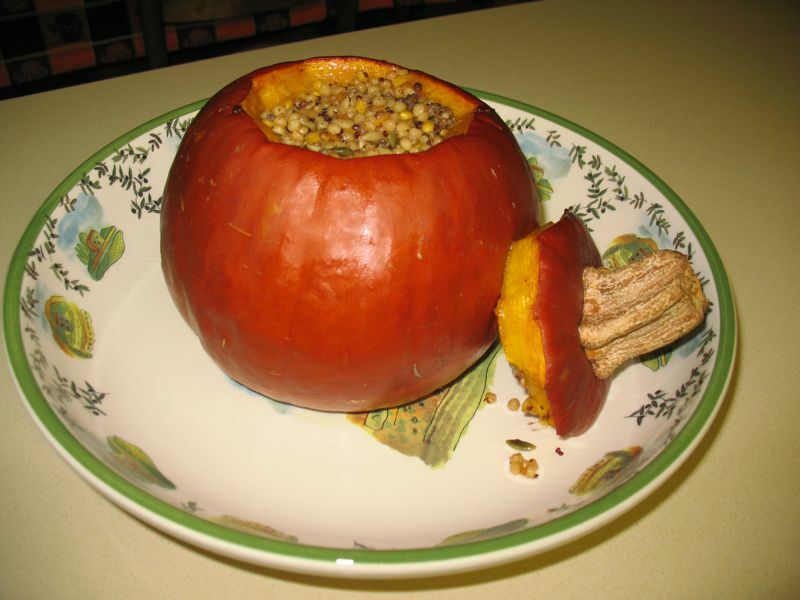 Cook until al dente–it will continue to cook in the pumpkin. Add this slightly soupy mix to the sausage and mushrooms; stir to mix. Spoon into your pumpkin, and don’t pack it down. Just loosely spoon it in. Set the pumpkin on a cookie sheet that has been lined with a sheet of parchment (or a Silpat) and bake at 350 for 90 minutes to 2 hours. Check at 90 minutes. The tip of knife blade should go in easily. If the mixture is too soupy (mine wasn’t, but Dorie’s was) leave the lid off for the last few minutes. Serve with freshly grated cheese, to be added atop the melange. We served it by slicing it into wedges, then scooping out the mushroom/sausage mixture into a shallow bowl, topped with the cheese. Encourage your guests to mix the cooked pumpkin with the rest–delicious. I decided to try this again tonight, to see if we still liked it. We did. It’s perfect for a fall supper, and since a) today’s the last day in November–made it under the wire for fall, and b) we’re supposed to get a ten-year wind event tonight. The house is creaking and moaning, and it feels like a Winnie-the-Pooh blustery day. 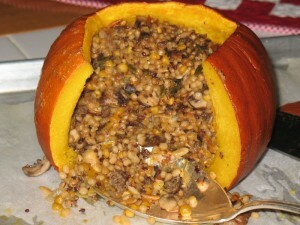 **Harvest Grain Blend: Could substitute a mix of pearl couscous, red quinoa, orzo and miniscule baby garbanzo beans. At least that’s what the package says is in there. This could be a fun Halloween tradition. My sister always used to cook their family’s jack-o-lantern on November 1, but that seems a bit heartless. (And there would be no way to stuff it like this because of the cut-outs.) I like this a LOT better! Pingback: A Quiet Week | OccasionalPiece--Quilt!